[2018 Update] Make up your mind Talenti! This might be the first time that I've seen a flavor change it's name twice. I wasn't in a rush to pick this one up but I was digging the anniversary markings on the container (Mango and Chocolate also have cool containers). I think I got a freezerburned container though because the texture wasn't so good, and the flavor? Well, it reminded me of the vanilla extract in the cabinet. Hopefully my pint was a fluke! 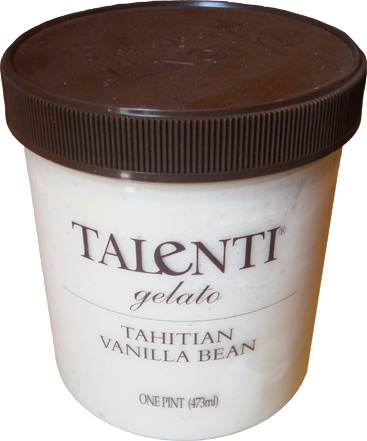 [2017 Update] I forget exactly when, but Talenti dropped the "Tahitian" from their vanilla gelato. From a monetary perspective, it makes sense that things change as Talenti grew bigger and costs were streamlined. That said, a few people pointed out that this one just isn't as good as it use to be. Having tried a pint recently, I still believe it to be good but I would no longer consider it to be the best. It happens unfortunately. Nick's original review after the break. [By Nick] Oh Talenti, how I’ve always wanted to try you but haven’t had the opportunity to do so. Well not until recently when you guys started showing up in stores around me. Now my selection is very limited and Dubba has reviewed a good amount of Talenti products, so what better way to introduce myself to a new brand by trying out their most basic flavor, Tahitian Vanilla Bean. Normally I’d like to judge a new company on how well they make their butter pecan but seeing as they don’t make that, vanilla will have to do. 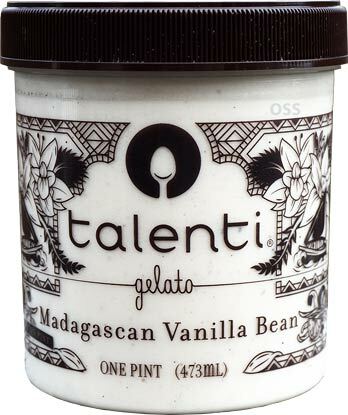 Simply described as “fresh whole organic Tahitian vanilla beans imported from Papua New Guinea produce a classic clean and fresh vanilla flavor”, Talenti still manages to make this sound very enticing. The very minimal list of ingredients is also a plus, I mean, when was the last time you saw something contain only 7 ingredients? Like all Talenti products, their containers are see-though so you have a good sense on what you’re getting into before you unscrew the lid (I love this design so much). Removing it though, I’m greeted with a little bit of ice crystals. No big deal, I can just scrape those off. Taking a bite, I think I’ve found the greatest vanilla in existence. It’s just so clean and pure. I don’t believe I’ve ever had a vanilla quite this intense and that’s a good thing. I’m dumbfounded trying to find the words to properly describe this flavor though. Just think of the greatest vanilla you’ve ever had and multiply it by 100, easily. I actually had to pause after my first bite to register all that was happening. The texture is equally as amazing. It’s remarkably creamy and very dense in a good way. If I didn’t have any willpower I could’ve easily ate the whole thing. It’s ridiculous how silky smooth it is. It goes down so easily that you’re already through a serving before you know it. The best way to put it is that it is velvet in gelato form. My word, why haven’t I tried this stuff sooner? On Second Scoop: Okay I’m just going to be honest; I went back for more about an hour after I first tried this one. I just couldn’t control my cravings, it truly is that amazing. Man, I feel bad that my taste buds haven’t been acquainted with Talenti before this. I definitely need to try more of their flavors as soon as possible. Why are you still even reading this? Go get your keys and pick up a pint for yourself. You’ll be thanking me later. 2013 Update: After a few comments suggesting that Talenti's Tahitian Vanilla Bean had changed for the worse when they switched packaging, I knew I had to go grab a new pint to investigate. Besides the change in which gum they used, the ingredient list is exactly the same as the old packaging. That doesn't mean much since they could have tweaked quantities without it rearranging the ingredient list. As for flavor, I can't say I could taste a change at all either. I'm guessing those who experienced a difference must have gotten a bad batch. I was worried that Talenti did change the recipe but I'm beyond relieved that it wasn't the case. This still remains by far my favorite vanilla on the market. Buy Again? Do you even have to ask? Hands down without a single doubt. Dubba's Thoughts: Yeah, this one really is wonderful, it's right up there with Graeter's vanilla ice cream. 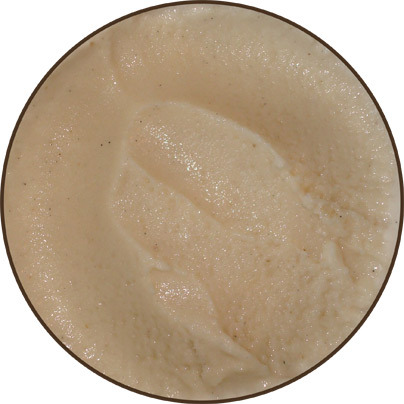 It's a rich, clean, pure vanilla flavor with great Talenti gelato texture. There's even a bit of sugar cookie or soft server flavor vibe to it. Yeah, I just ate half a pint in about 3 minutes. wow, its that good? I just had my first talenti experience last week with sea salt caramel and I fell in love with it. That was the only flavor that got great reviews across the board... havent herd the greatest things about their other flavors, but you are usually spot on with reviews. gonna grab this and another SSC since its on sale 2 for 6$ (a stealll)....also, cool idea here: once you finish the pint its always fun to re-stuff the plastic container with other ice creams. I usually use it for blue bunny/friendlys/turkey hill type ice creams once they are getting close to the bottom of their half gallons so I dont have to devote so much precious freezer space to those massive cardboard containers...its also a nice container to do a make you own mix in pint. toss in your base flavor(s), then your mix ins, stir it up and back into the freezer! I've heard good things about ssc but haven't been able to get my hands on it yet. I do like your ideas for reusing the pint containers though. Right now I have candy corn m&m's in one of them aha. if you like rolos, or caramel in general you will be in heaven. Im honestly not even the biggest caramel fan but i was blown away. I think its my favorite ice cream to date. The texture....my god! I have high hope for this one though Nick, Im a sucker for a good vanilla. Im usually perfectly content with breyers natural vanilla (or haagn dazs if i can fit the cals in), but I can imagine a great vanilla flavor with the unique gelato texture is money....and Danielle, yeah even if you dont use the containers for ice cream, they are the perfect size for many other things. definitely another plus of this brand. Well I'll keep looking for it. Did you find it around here or downstate where you are now? Also I'm not even that big of a fan of vanilla so for me to be blown away by this is saying a lot. If only they made a butter pecan, I would probably die on the spot. Let me know what you think about this flavor when you try it though. found it down here at shoprite, but have seen it at albany shoprite and various price-choppers around capital region...gonna [hopefully] pick this up tmw. will let you know my thoughts once I try it. may even review it on my blog, been a while since ive done an ice cream review. I guess a trip to Albany will be in my near future. I have spotted the caramel cookie one which I'm definitely trying next. I also guess the fresh market in latham has a bunch of talenti varieties and other brands so I'll have to go find out what that place has to offer as well. fresh market also has high road, and jenis, and im sure some others im forgetting. the two I mentioned have garnered a lot of press in the ice cream world, but will also set you back like $12 for a pint! would love to see some reviews of them though, ice-cream informant has scooped a few of them. Hmm good to know but I really can't justify $12 of a pint for Jeni's to be honest. I have been looking at High Road's offerings though so I might have to go check out them out sometime. I actually didn't know they were carried around here. Thanks for reviewing this for me! I had a feeling that it'd be a good flavor since I have heard nothing but positives about it. I had a feeling you might be more impressed with this flavor than Graeter's vanilla! I actually haven't tried Graeter's vanilla yet. I tend to stray away from things Dubba has already reviewed but I've been meaning to try their's soon. snagged this up. just took a spoonful. OMG. you were right, incredible. I still give the slight nod to SSC just because its a very unique flavor, but this is definitely the best vanilla ive had. Different authors for the Talenti and Graeters vanilla, so we don't really have a champion of vanilla quite yet. Aha I'm happy that you were as impressed as I was. My dad who lives in Voorheesville saw my review and thought it would be a great idea to surprise me and bring me a pint of the SSC. I'm about an hour away from him and he didn't put it in an isolated bag or anything. Lets just say when he arrived, it was just a puddle of sadness. OH NOOOOO! did u even try to refreeze it (i know it usually wrecks the texture), or at least take a sip of the resulting "milk shake"? I dont blame you if you didnt, but you MUST TRY IT! Im reviewing it right now after re-scooping. Aha I did throw it in the freezer to see what would happen but it just turned into a thing full of ice crystals. So not to ruin the experience I just dumped it out. I'll try it soon enough though. Talenti was finally on sale so I decided to finally purchase the Tahitian Vanilla Bean, and after reading so many positive reviews about this one I was excited to try it. I was extremely disappointed though. The flavor was extremely boring to me. While the ice cream is soft and creamy, I prefer mine mostly melted because it's sweeter that way, so the creamy texture didn't really matter to me. I felt that it could have been sweeter and more vanilla flavoring. After one scoop, I was too bored to have more. It does have a pure and clean taste to it as you described but perhaps I am just so used to the artificial ice cream flavors that I grew up on, that use a billion of ingredients, to appreciate this gelato. Stride, sorry to hear you weren't as impressed as I was. This is easily my favorite vanilla flavor on the market but everyone has their own opinion. If anything, give some of their other flavors a shot, hopefully you'll find one that blows you away like this one did for me. I will most definitely try other flavors from Talenti, especially the Milk Chocolate and the Sea Salt Caramel flavors. I think I just wasn't in the mood for vanilla when I first tried the Tahitian Vanilla Bean, but since I still have a pint of it left, I'll let you know If I end up changing my opinion on the Tahitian Vanilla Bean. I tried it on a recent trip to Florida and, while it was nice it didn't blow me away. Like Hagen Daaz & Ben and Jerry's. I wouldn't bother getting it again. Also tried Rita's Frozen Custard and threw it away. Absolutely terrible! It was like eating frozen cool whip with less flavor. Anon, I haven't tried it in the new packaging yet but I'll have to grab some soon. Gums are interchangeable/don't really add flavor so that probably isn't the reason. Have you tried it more than once since the repackaging? If not, you might've just got an off batch. Like I said, I'll investigate on that soon! Anon: Okay, this is definitely bugging me. Next time Talenti is on sale I'll be sure to pick up a pint. I really hope you just ended up getting bum pints because that was the best vanilla I've ever had. I have noticed the color/flavor change in their new packaging as well. The Sea Salt Caramel flavor has a different color and slightly different texture in the new packaging. Also, after a few bites there's a slight but unappetizing aftertaste that starts to develop (similar to the taste water in plastic bottles achieves after sitting in the car for a bit). I wrote to talenti twice on the subject. The first time they guaranteed me that the recipe had not changed. The second time I challenged that with the notion that if the recipe had not changed then how could the color have changed (that I have photo documented)? No response since then. all too sweet. I guess that's what consumers want in America. Gosh, I wish I could give you the nearly full container that's in my freezer then. The only thing I can think of to do with it (besides throw it out, and it's too expensive to waste), is to use it as the base for a milkshake or frozen cocktail. My roommate and I, who both LOVE vanilla, thought this had an odd flavor and a funky aftertaste. Plus, I found it to be overly sweet. I'll stick to my standbys: Mediterranean Mint, Sicilian Pistachio, Caribbean Coconut, and Sea Salt Caramel, and leave the Tahitian Vanilla Bean to you. Karen, I'm sorry for your experience but this still stands as my favorite vanilla on the market. Might want to contact Talenti with your experience though. I'm sure they could remedy things so you don't have to feel like you have to use the rest of the pint. It may as well been myself who wrote this review. Man this stuff is amazing. I stop myself at half of the pint but I definitely could eat the whole thing without an issue. I've also tried the Talenti Belgian Chocolate (quite good), Double Dark Chocolate (meh). I have the Roman Raspberry (though it's sorbetto, not gelato) in my freezer but haven't gotten to it yet. I've noticed they dropped the woed "Tahitian" from the flavor name. Now it's just Vanilla Bean. 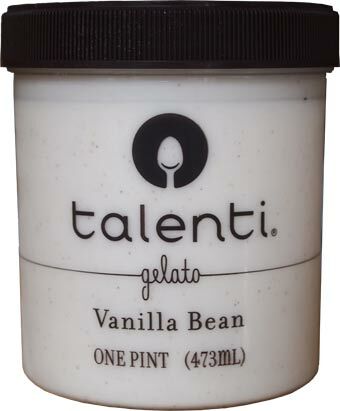 I also noticed Talenti is now a subsidiary of Unilever. Perhaps that could explain this change? They're now using cheaper vanilla beans? I should probably get a new pint so I can add an updated picture (like I have with some other reviews). Yes, Unilever does own Talenti but they actually bought them back in 2014. Since then it does seem that they have slid to a more mass produced quality from their original small company quality. The biggest change has been less mix-ins and swirls. It's still a good product but not 100% of what it used to be. while this seems a bit rough, it does add weight to the fact that this isnt the same flavor it was 6-7 years ago.